A comprehensive resource for teachers P-2 to incorporate self-regulation activities into their daily classroom routine. 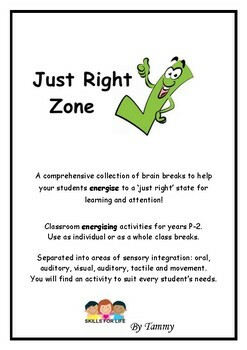 This set of brain break ideas can be used by your whole class or individual students. These energizing breaks help students to re-energize when their body is running too slow. This collection includes energizing ideas across all sensory input areas including oral, visual, auditory, tactile, smell and movement. There is a sensory purpose behind every activity, they are not simply movement breaks and offer an extension on traditional movement brain breaks. 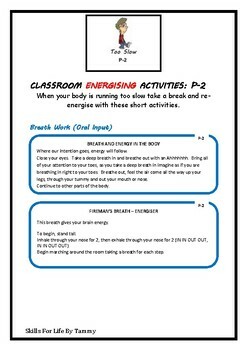 Use these activities to assist students to re-energize their bodies when they are tired, bored, off task or simply unable to focus. Use them at anytime during the day when you feel your students need to energize (fast) their bodies up.